After wrapping tightly in plastic wrap, twist the end into a “stem” and tie off with raffia or twine for a fun little country pumpkin. Print off the labels to identify the flavor at parties and thread through twine. Might I suggest printing them on card stock for added stability. Pop the popcorn your preferred way- stovetop, air popper, or even microwaved. Transfer to a large bowl, making sure to remove all un-popped kernels. 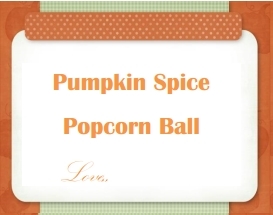 Fill another large bowl with ice water, lay out waxed paper or aluminum foil for popcorn balls to set on. In a small container like a paper cup mix pumpkin pie spice, vanilla, and cinnamon, set aside. In a large saucepan combine; corn syrup, brown sugar, salt and butter. Simmer over medium-high heat, stir constantly until mixture boils. Allow syrup to boil, unstirred until candy thermometer reaches 275°. Remove from heat stir in spice and vanilla mixture. Pour syrup over mixture and use a wooden spoon to coat popcorn kernels. Let cool slightly. Makes about 18 popcorn balls. 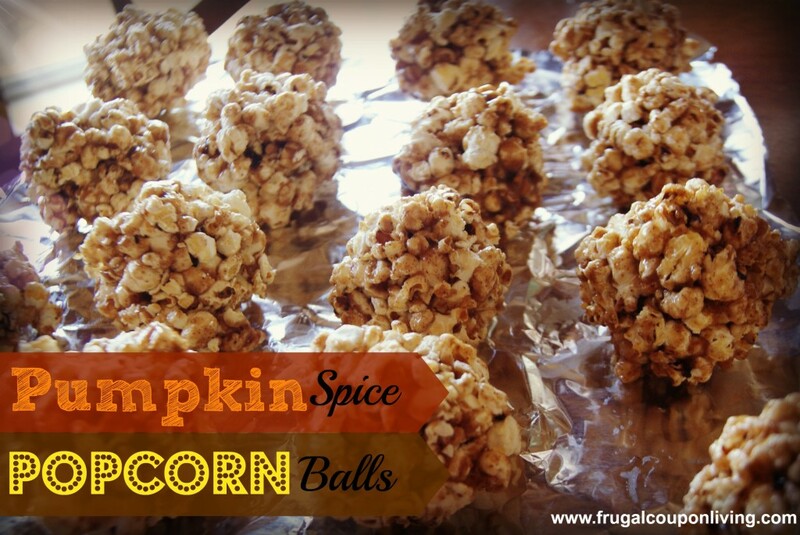 Like the Pumpkin Spice Popcorn Balls Recipe? Be sure to Pin to Pinterest and to find more Pinterest Ideas and Recipe Ideas on Frugal Coupon Living.